Dimensions (HxWxD): 1.85" x 1" x 1"
This gorgeous Luminous Violet Blue Green Humboldt County,Nevada, Opal Specimen exhibits large areas of electric blue, turquoise, bright violet, and bright sky blue, with flashes of electric purple and green iridescence sparking all across its face. 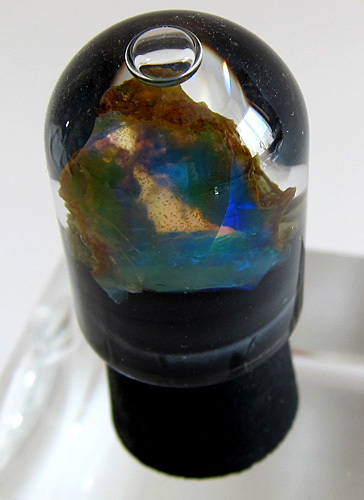 This gorgeous Humboldt County Opal has varying shades of colors of the dawn: blue, green, & sparks of golden fire visible in the photos here. See other views of this amazing & stunning stone below. The miner who found these beauties has preserved them, as you can see here, in lovely rubber stoppered vessels with water to show off the opal's amazing color light show effects! 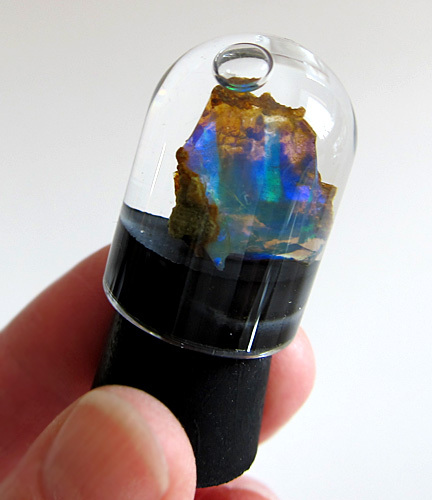 This Luminous Violet Blue Green opal still retains a portion of a sandy colored matrix on its back side, which is further proof of its origins. 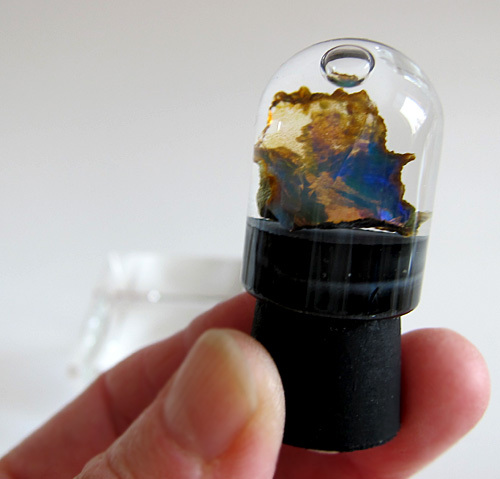 Because of the widespread production of synthetic opals, which began in the 1970s, mineral collectors love to see a little matrix on the stone! 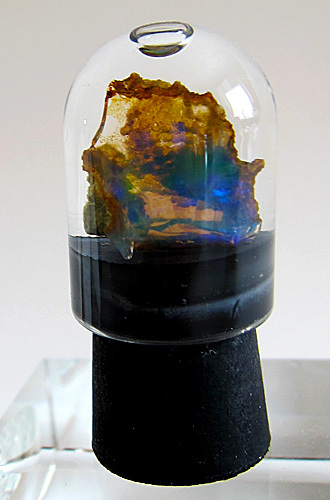 This multi-colored Luminous Violet Blue Green Opal would also resonate with the energy of the various chakras considered to be golden, blue, green, aquamarine and purple -- the crown, throat, heart and third eye chakras in particular. Thus the Humboldt County Luminous Violet Blue Green Opal activates and energizes all of the upper chakras simultaneously! To connect with the energy of the Fairy Spirit Opal, simply place the opal on your altar or table, and sit quietly, viewing the stone from different angles and meditating upon its origins. Try to visualize the series of geological changes that the Virgin Valley underwent while producing this amazing gemstone like a little movie in your mind. 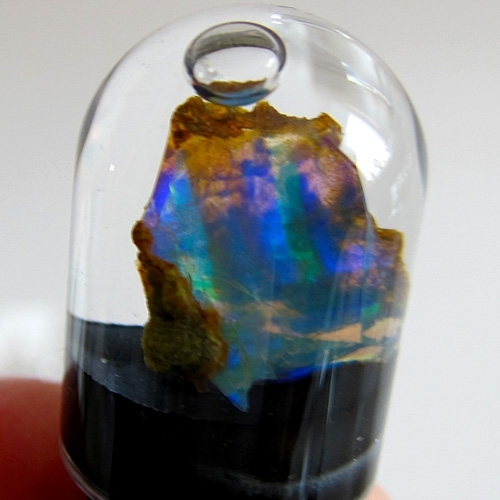 Talk to the opal and ask that it share the energies of completely pure blue, green, rose, aquamarine, purple and gold with you. Close your eyes and concentrate on those colors. Visualize them in your mind's eye. When finished, say a word of Thanksgiving to Grandmother Earth, who is sharing her treasure with you, a little piece of her own nervous system, and also thank the opal for all the beautiful visions it has sparked in you. Above weight is shipping weight. Net weight is 23 grams.